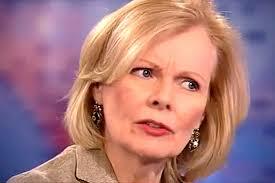 Poor Peggy Noonan (pictured). Hers is an unhappy lot. Noonan was a primary speechwriter for President Ronald Reagan, and I think it is fair to say that while the nation has moved on, Noonan has not. Politics, post-Reagan, has never quite measured up for Peggy. To give some examples, in 2015, as reported in Salon, Noonan "sneered" (Salon's word) that "Obama’s presidency means anyone can run for president now." Well, that is what they used to teach us in grade school. "Anyone" can be president in this land of opportunity. That is what I was told. But "anyone," for Noonan, doesn't include a black man named Obama. So far, no woman, either! It's pretty obvious that Obama actually believed the hype, and then he actually did get elected president. Noonan doesn't want that kind of mistake to happen again! It is like '"Oh my God," she said. "For the American people, what is their impression of the people who populate politics when they see stories like [Trump's] campaign manager being accused of being on the take. The Clinton Foundation stuff. It looks so bad, I'm very disturbed [about] the extent to which real-life modern politics is starting to look like something out of "Scandal" or "House of Cards." They're supposed to be wacked-out entertainments that have nothing to do with reality, which is how I like to think of them, but it is disturbing, these stories. A third example of Noonan's disdain for the current state of our politics is found in her Wall Street Journal column published in the June 4-5, 2016 hard copy edition. This column bemoans the failure of the Republican Party to deal with the outrageous inadequacy and unsuitability of Donald Trump, a theme consistent with her general feelings about the current state of our politics, as outlined above. Clearly, whatever is happening now, politically, does not measure up to Ronald Reagan and that golden age gone by. Poor Peggy Noonan! Finally she found a group that reflects her own feelings about the "stultification of political ideas in the United States," and we find, in fact, that there actually isn't such a group and that there isn't any "Journal of American Greatness." The Journal of American Greatness began some months ago, to a large extent anyway, as an inside joke. At a certain point its audience expanded beyond any of our expectations. It also ceased to be a joke. Thus it no longer makes sense to continue it in its current form. No journal is meant to last forever, and this one won’t try to. We’ve decided to call it a day. The inspiration for this journal was a profound discomfort with the mode of thought that has come to dominate political discourse—an ideological mode that makes nonsense of the reality of American life. The unanticipated recognition that we have received, however, also makes clear that many others similarly felt the desirability of breaking out of conservatism’s self-imposed intellectual stagnation. Should any such market for our ideas exist in the future, we may participate in it. But we will do so in a different way. In closing, we simply want to thank our readers—we never expected so many of you—who made this extraordinary adventure possible over the last four months. This is all kind of fun - inside baseball for the most intellectually pretentious members of the Republican establishment. I only have one question about The Journal of American Greatness. Is the joke ON Peggy Noonan, or is the joke BY Peggy Noonan?